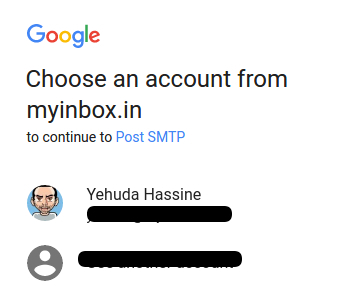 Go to Google Developer’s Console and login with the same email address that you are configuring Post with. Choose ‘Create a New Project’. This project will be for Post SMTP only. Select ‘Consent Screen’ from under ‘APIs & auth’. Into ‘Email address’ choose the correct Gmail address and in ‘Product name’ put ‘Post SMTP’. Choose ‘Save’. Select ‘Credentials’ from under ‘APIs & auth’. Choose ‘Create a new Client ID’. For the ‘Application Type’ use ‘Web application’. In ‘Authorized Redirect URIs’ enter the ‘Redirect URI’ given by Post (either from the wizard[screenshot], or from the manual configuration page[screenshot]). Enter the Client ID and Client Secret displayed here into Post’s settings page screenshot. To get the Client ID and the Client Secret. Visit this URL and log in to your Gmail Account if asked. Select Create Project and then Continue. After a few seconds, the next screen will appear, select Go to credentials. Skip the current screen by clicking Client ID like the image below. In this step, you will need to name your project, press the button on the right. Enter the Email address, fill product field and then Save. On the Create credentials drop-down, select OAuth client ID. Select Web application, name your app and then copy the fields. I marked from the one with the same colors from the step number 8. Now, copy the Client ID and Client Secret from above and paste them in their respective fields on step number 8 and save. 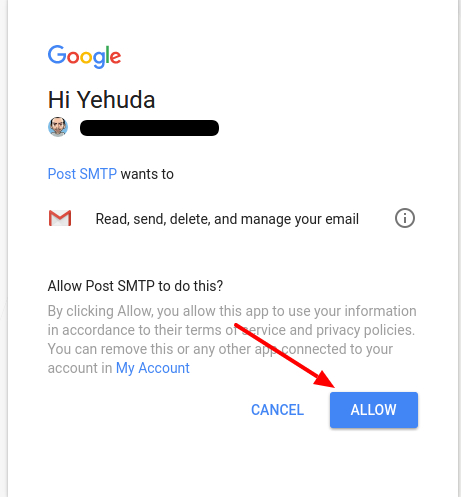 Now from the page of Post SMTP under actions, select Grant permission with Google. From the dialog box, select the Gmail account you want to use sending emails. Approve the APP Name you used to send emails. To verify you configured everything correctly, just check that your status matches this one. The last step is to use Send a Test Email option to verify that everything is working as expected. Enter the destination email, if everything is configured properly, you should get a report like this one. To create an application, you’ll first need to sign into your Gmail account and access Gmail’s application registration. Clicking that link should open this Google page in a new tab or window, and you’ll want to keep your site settings open (we’ll return to those later). 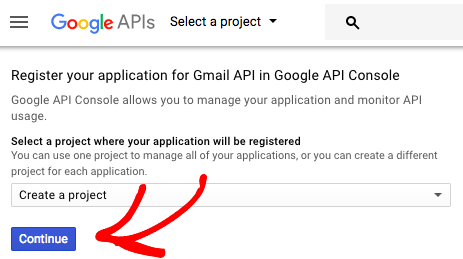 Once you’ve followed that link and logged into your Gmail account, you should see a form named “Register your application for Gmail API in Google API Console”. In the dropdown labeled Select a project where your application will be registered, leave the default option of Create a project. Then, go ahead and click the Continue button. Next, you should see a screen that says “The API is enabled”. To proceed to the setup page, click the Go to credentials button. Once you’ve made these selections, click the What credentials do I need? button to go to the next step. For this step, you’ll be creating an OAuth client ID. OAuth, or Open Authorization, is what will provide permission for your website to use your Gmail account to authenticate emails. For the Name field, enter anything you like or leave the default name. This is only for reference within your Google account. Last, we need to fill out the Authorized redirect URIs field. To get the URI for your site, you’ll need to go back to the tab or window with your WordPress site. Still on the Settings » WP Mail SMTP page, you’ll need to look under the Gmail section for the field labeled Authorized redirect URI. The value in this field should be your site’s URL followed by some extra details. You’ll need to copy this value, which is easily done by clicking the button with the copy icon. 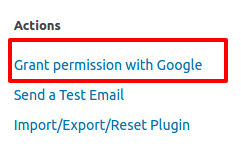 After copying the URI, return to the Google APIs page and paste it into the field under Authorized redirect URIs. After that, you can click the Create client ID button. For the last step in the app creation process, you’ll need to set up the consent screen. This screen will never be seen by your users since you’re only granting permission for your own site to use the Gmail account you own. You’ll just need to check your email address and then enter a Product name shown to users (such as the title of your website). When you’ve completed these fields, click Continue. 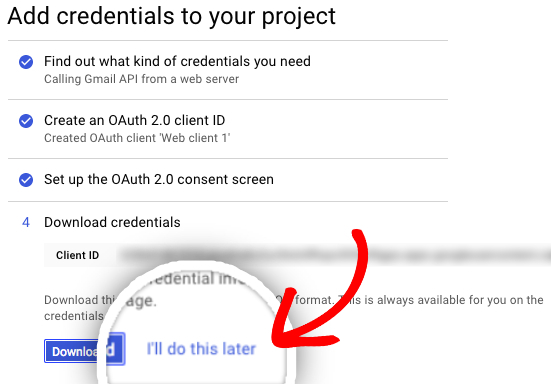 You’ve now successfully created a Gmail web application! Now we need to see the full details. On the last screen, click I’ll do this later to go to the Credentials page. On the Credentials page, you can now see the details of the web application you just created. To view Client ID and Client Secret, click the edit icon. This will open all of the details for your app. On this page, you’ll need to copy the Client ID and Client secret values. Always create beautiful things with love.